Vehicular Ad Hoc Networks (VANET) is an emerging application of Intelligent Transport System, which is mainly to assist public safety applications such as collision avoidance between the vehicles or between vehicles and other obstacles such as pedestrians. At the same time, it challenges the data communication because of its high mobility, short link lifetime, and frequent network fragmentations. Existing spectrum standard for vehicular communication underutilizes the frequency bands in the sparsely used regions when the licensed users are not deploying them even at the peak hours of the road. Congestion or route stalling is unavoidable in vehicular networking and this builds an impression that there is always a shortage of spectrum. A solution would be to have a cognitive radio that can utilize the spectrum that is not heavily used so as to ease congestion in other areas. This chapter brings out the application of cognitive radios in vehicular environments, a new and relatively less explored area of research. This chapter looks into a few existing studies in the literature which have focused on spectrum sensing techniques, routing methodology, and security for cognitive radio vehicular networks. In addition, this chapter also discusses the impact of changes in the vehicular network on the radio propagation channel and in turn on the operation and performance of the cognitive radio vehicular network. Finally, future directions in research have highlighted the existing challenges in specific areas. Vehicles continuously move in and out of each other’s range due to high mobility. IEEE 802.11p technology works well for Dedicated Short Range Communications (DSRC). However, this technology is based on dedicated channels, which tend to use the available radio spectrum inefficiently due to the fixed allocation of radio frequencies by the regulatory authorities. This leaves frequency bands idle when the licensed user is not utilizing them. This creates the impression that there always exists a shortage of spectrum for users in the heavily used spectral regions. The sparsely used regions are underutilized. A solution would be to have a cognitive radio that can utilize the spectrum that is not heavily used so as to ease congestion in other areas. 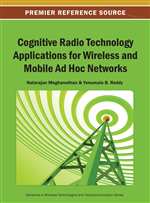 Cognitive radio (CR) network represent a paradigm shift in both radio and networking technologies, with the potential to provide major gains in performance and spectrum efficiency. CR user activity model in spectrum management is illustrated in Figure 2 as proposed by Akyildiz et al. (2009) and further updated by Marco Di Felice, Kaushik Roy Chowdhury, Wooseong Kim, Andreas Kassler, & Luciano Bononi (2011). The objective of this book chapter is to enumerate some of the applications of cognitive radios in vehicular networking especially in spectrum management, routing and defense against Sybil attack. This chapter explores recent technologies proposed on spectrum sensing, channel allocation, security measures and routing in cognitive radio vehicular networks. This chapter also brings out the impact of radio propagation channel modeling on the performance of the cognitive radio vehicular network.